The Indian Council of Food and Agriculture (ICFA), a non-governmental organisation working for the welfare of farmers with the help of state governments in the country, started the Karnal District Agriculture Council (KDAC) today. Chief Minister Manohar Lal Khattar and Agriculture Minister OP Dhankar launched the council from the auditorium of the Central Soil Salinity Research Institute (CSSRI) during a state-level Haryana progressive farmers convention organised by the ICFA. 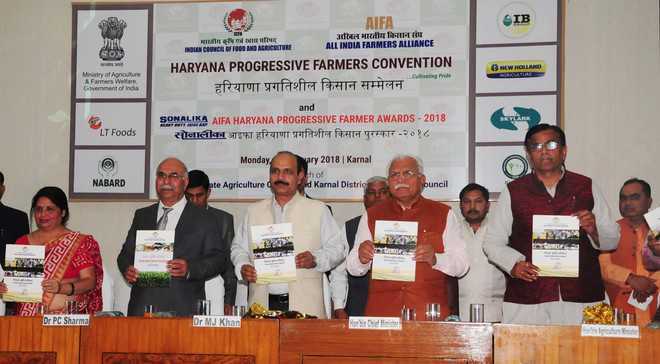 Several progressive farmers were honoured for their outstanding work in farming on the occasion. The CM and the Agriculture Minister assured the ICFA of extending all kind of help for the uplift of farmers. The Karnal council is the second one after Lakhimpur in Uttar Pradesh where this initiative has been started for the welfare of farmers. Khattar also announced starting the council in every district. The KDAC would work under the chairmanship of Dr Gurbachan Singh, who had served as the chairman of the Agricultural Scientist Recruitment Board and Union Agriculture Commissioner. The council would provide a common platform to farmers and scientists for a better yield and double the income of farmers. As many as 50 members would be nominated to the council, which include progressive farmers, development officers of various departments of the state government, scientists, social activists, members of various NGOs, representatives of various agricultural implement manufacturers and others. The ICFA would soon start the Haryana State Agriculture Council. Khattar, while addressing farmers, exhorted them to conserve rainwater and also adopt micro-irrigation and sprinkler irrigation techniques instead of flooded irrigation to save precious water. The Chief Minister urged farmers to adopt solar power for operating tube-wells to save electricity. He cited the data that there were around 6 lakh tube-wells in Haryana and Rs 1 lakh annual subsidy was being given for each tube-well, which could be saved by adopting solar energy.